One of the struggles with eating healthier is giving up your favorite foods. If you have been trying to stick to a grain-free diet, but miss eating pancakes in the morning, then you will love this 5-minute pancake recipe. These easy-to-make pancakes are full of protein, from the oats and eggs that are included in the recipe. You will also get a healthy serving of carbohydrates and good fats. 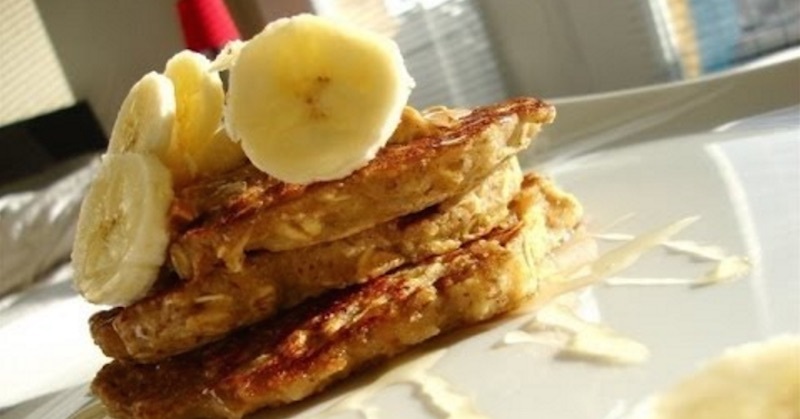 A much healthier alternative to regular pancakes, this recipe does not use any flour or grain. Serve these pancakes for breakfast, to send your kids off to school with a healthier version of pancakes. You could also use this recipe to prepare a healthy post-workout meal, as they have a good ratio of protein to carbs. If you have a large family, you could multiply the recipe to make even more pancakes. Combine all the ingredients in a blender and blend until they are thoroughly mixed. While you are blending the ingredients, heat up your pan and coat with a small amount of coconut oil. Let sit in the hot pan for a couple of minutes and flip the pancakes. Cook for another minute or two, or until the pancakes are browned. Serve while hot. This should yield four pancakes, depending on how large you make them. The consistency is similar to regular pancakes, but sweeter, so you can have it without the syrup. If you would like to use syrup, use the real maple syrup. This is just one example of how to eat healthier, while still enjoying your favorite meals. The trick is to find recipes that mimic your favorite meals by replacing the less-healthy ingredients with fresh, whole foods. In this pancake recipe, the use of bananas and rolled oats helps replace the use of flour found in most pancake recipes. To stick to your dietary goals, gather a large variety of recipes, starting with this protein-packed grain-free pancake recipe. Keep your recipes in a binder or bookmark them in your web browser. Before long, you will have your own cookbook that sticks to your grain-free or gluten-free diet.